Email marketing is one of the most successful online campaigns when it comes to generating leads and monetizing them. The larger your email lists then the better chances for you to reach a broader audience and offer your services to them. You need an email verifier software to confirm your list before you start sending off those emails. Email campaigns are more effective when it comes to driving conversion to your sites as opposed to other methods and it is also relatively cheaper. . It’s also permanent unless your user unsubscribes to your channel, it’s not by chance that your posts will show in your followers list unlike social media. Large email lists provides you a better platform for your business and promote your products. You should also consider deliverability aside from the steady growth of your email lists. Yes a large email list is important but it can be less effective when you have poor deliverability. Being able to deliver your emails to the recipient’s inbox is something that you have to achieve in your campaign. However, sometimes it can land in the spam folder for several reasons. Poor content, lack of engagement and even poor reputation from the internet service providers. You should also engage with your audience so that it will prompt them to click your links. Engagement rates are high whenever users open your emails and especially that those that have landed in the inbox. Lesser engagement happens for emails that landed in the spam folders unless they are very important. Why do you need an email verifier? Collecting data is essential in every online business, how else would you be able to connect with your audience? Verifying the stored data is another thing. Many online marketers overlook the importance of using an email verifier. It is very important since it can affect your reputation as an online marketer and email sender. You are using the name of your company; it would affect you greatly seeing that your emails are flagged as spam by internet service providers. Most people wouldn’t trust emails that land in their inboxes unless they know it’s from a trusted source. You need to update your database frequently in order to save yourself the trouble of sending emails to addresses which are already out dated. The accuracy of your data depends on how many times you update it. Most people tend to update or use different emails for several reasons, no matter what the reason; you should be able to take hold of a valid and relevant email and not ones that have gone stale. 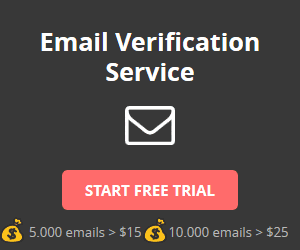 Don’t waste your budget on dead information; always run your email lists under an email verifier to guarantee that you will have an updated list and one that is clean from erroneous emails. Wrong information can be entered during the sign up process on your website, intentionally or not. It’s important that you check this information, especially the emails if you are planning an email campaign for your website. Growing an email list can take a while and weeding out those invalid emails can also take a while. If you have reached a good number of emails then you can start your email campaigns. However, your email campaigns can be affected by the quality of emails on your list so it’s very important to use an email verifier. These software can easily be accessed on the net depending on your type of campaign and budget. There are a lot of different email validation software but they all do the same thing, that is to remove unwanted and invalid emails on your list to make sure you have a successful email campaign.